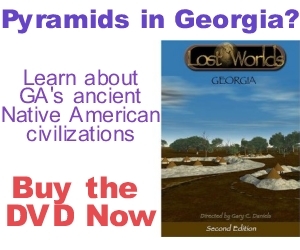 Watch an excerpt from the Lost Worlds: Georgia DVD. Buy today or make a donation and help support LostWorlds.org. All proceeds help fund future videos and exhibits. Six hours southeast of Atlanta off the Georgia coast on Sapelo Island, archaeologists have unearthed the remains of an ancient walled city which predates the construction of Egypt’s pyramids. Known as the Sapelo Shell Ring Complex, this ancient city was constructed around 2300 B.C. and featured three neighborhoods each surrounded by circular walls twenty feet in height constructed from tons of seashells. Some of the earliest pottery in North America was also found buried in the remains of this lost city. The site is quite an enigma because at the time of its construction the Native Americans living in the area were simple hunters and gatherers who had yet to invent agriculture. 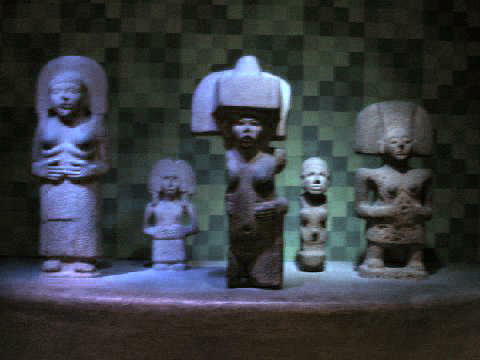 Many scholars believe agriculture is a prerequisite for civilization. Did these simple tribal people somehow make the leap from hunting-and-gathering to civilization in a single bound producing not only a walled city but also the new technology of pottery without the benefit of agriculture? 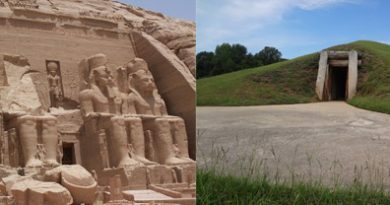 Or did an already civilized people arrive on the coast of Georgia from elsewhere and, if so, where did they come from and why? 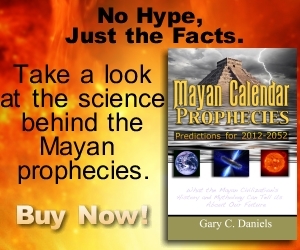 In the Middle East, Akkadian Sumer collapsed at this time and the Dead Sea water levels reached their lowest point. In China, the Hongsan culture collapsed. Sediments from Greenland and Iceland show a cold peak around 2200 BC. The population of Finland decreased by a third between 2400 and 2000 BC. In Turkey’s Anatolia region, including the site of ancient Troy, over 350 sites show evidence of being burnt and deserted. Entire regions reverted to a nomadic way of life after thousands of years of settled agricultural life. In fact, most sites throughout the Old World which collapsed around 2200 BC showed unambiguous signs of natural calamities and/or rapid abandonment. What happened around 2200 B.C. that could have caused such widespread devastation? Meteor Storms & Cosmic Catastrophe? Evidence is mounting that this devastation came from the sky. Astronomers have theorized that at this time Earth passed through a dense concentration of cosmic debris. Just picture the asteroid scene in Star Wars and you’ll get the idea. Yet researchers don’t think much of this debris actually impacted the ground. Instead they believe these meteors exploded in air bursts high above the ground, creating an ancient version of an atomic bomb blast. 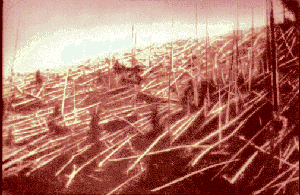 The Tunguska meteor flattened 80 million trees over 2000 square miles as seen in this photo taken in 1927. These air bursts would have first incinerated everything within tens if not hundreds of miles. Next they would have created hurricane force winds which would have obliterated any above-ground structures as well as forests. Astronomers believe this catastrophe was similar to the Tunguska Event which flattened 80 million trees over a 2,000 square mile area of Russian Siberia in 1908. Russian scientists believe this event was caused by the explosion of a large meteor tens of meters across at an altitude of 3-6 miles. A similar event is thought to have caused the climate downturn in 3200 BC which flash froze the so-called Ice Man in the Swiss Alps. Who Built the Sapelo Shell Rings? 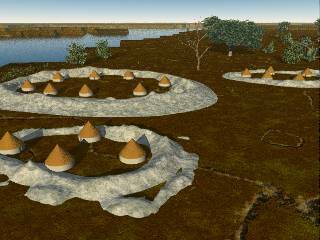 At the time of European contact, two Native American tribes were known for constructing round, walled villages: the Timucua and Yuchi. Archaeologists believe some time in the past the Timucua migrated to Georgia and Florida from South America since their language was similar to that spoken by Indians in Venezuela. Did they flee their homeland after it was devastated by a meteor swarm that destroyed huge swaths of jungle? The Rio Cuarto impact craters in Argentina are thought by some geologists to date to this time period which supports the idea that South America was affected by the same event that struck the Old World. 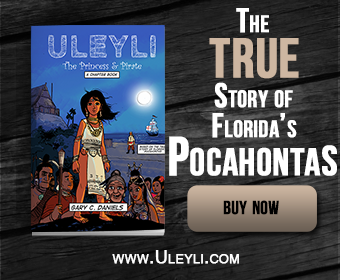 The Yuchi also have a legend that they arrived in Georgia after “the old moon broke” and devastated their island homeland in the Bahamas. Could they have thought these meteors were pieces of the moon falling to Earth? Could impact tsunamis have devastated their island home in the Bahamas forcing them to flee to the mainland? Only further research will answer the questions. Learn more about the lastest research regarding the Sapelo Shell Ring Complex. Or visit the Sapelo Island Visitor’s Center at 1766 Landing Road, S.E., Darien, GA 31305. You can also find me on Facebook, subscribe to my newsletter, watch my DVD “Lost Worlds: Georgia” or purchase posters, mugs, t-shirts, mousepads and other gifts featuring the Sapelo Shell Rings artwork at my Sapelo Gift Shop.